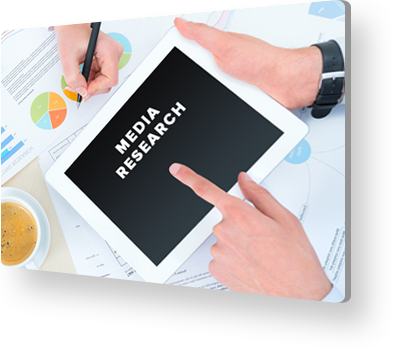 Media research is the study of social, psychological and physical aspects and effects of various mass media. It includes the collection and analysis of information with regard to newspapers, magazines, radio, TV, cinema and other mass media. We, at MPlan, provide well-researched solutions to our clients, laying out all possible options for conventional, as well as non-conventional, media buys. Our research includes on-ground and previous media inventory performances. We carefully analyze which media types are most likely to receive higher engagement, along with client objectives, industry trends and a lot more. The goal of media research is to understand each media audience. When you know your audience, you are in a better position of sending well-targeted advertising messages. The importance of media research varies quite extensively and highly depends on the industry in focus. However, an in-depth analysis of audiences, markets, and media type is just as important to devise the best possible goal-attaining strategy. We conduct consumer research based on behavior patterns, media types, demographics and platforms to be used. We help in discovering and converting the various possibilities for outdoor and print media buying. MPlan helps its clients in estimating the amount to be spent, based on their objectives. We provide you with the best research tools and help you evaluate certain factors that even a database may not be able to advise you about. The research we conduct guides our recommendations for campaign creation, ensuring that the buys are extremely targeted.